As a longtime user of Atlas Scientific's products, I've been impressed with the level of sophistication their devices have taken on recently. Along with continuing to grow their catalog with a variety of probes, devices and accessories, they have continually improved their probe circuits, once known as stamps and now branded as EZO™ circuits. These little boards make reading data from a variety of probes a breeze. SparkFun carries the pH Sensor Kit and the ORP Sensor Kit from Atlas Scientific, both of which contain the latest version of the EZO circuit. SparkFun very recently began to stock the new EZO Carrier Board, which allows the user to connect their EZO circuits to a laptop, PC or even single-board computer via USB. This little board not only makes hookup a breeze, but it also electrically isolates the probe and circuit from the rest of the system to eliminate interference, harmful voltages and other noise that could cause false readings. In addition to all this new hardware, Atlas Scientific has been working on data-logging software to accompany their easy-to-use hardware. 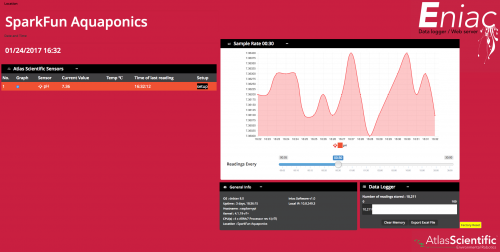 A Raspberry Pi-based data-logging/web server package, named Eniac, is currently available for beta testing on their website. 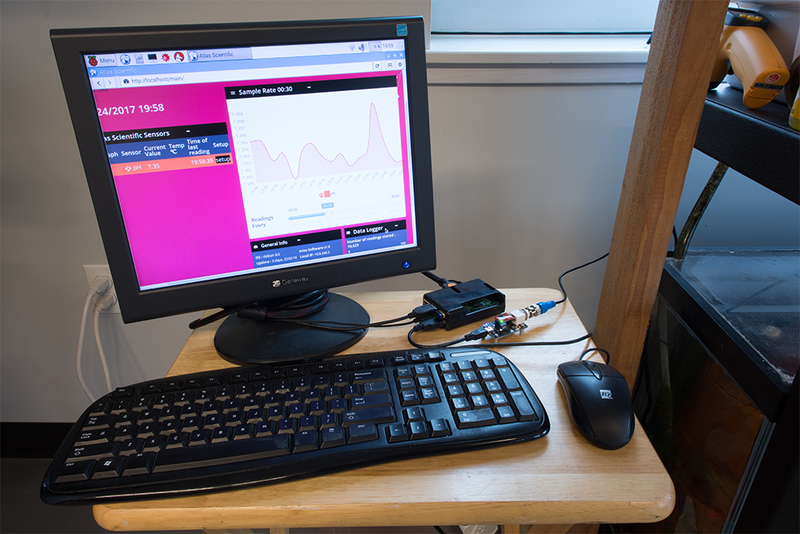 The software package comes bundled with the latest build of the Raspbian OS, making installation on a Pi a one-step process. 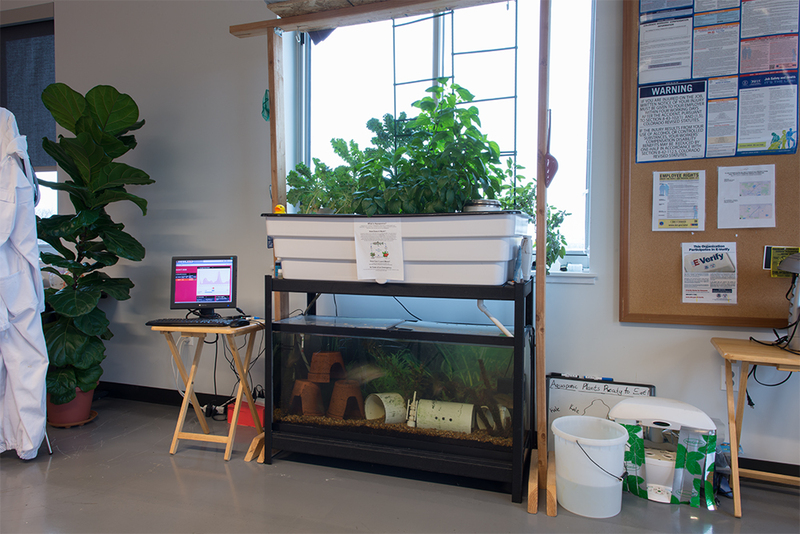 Given that I had yet to add pH logging to my aquaponics system here at SparkFun, this seemed like a great opportunity to get more data from my fish tank while also testing out the Eniac software package. Using a Raspberry Pi 3, the pH Sensor Kit and the EZO Carrier Board, I installed the logger near my aquaponics system, set it up to run over the weekend and waited to see what would happen. You can find all the parts used in this experiment in the wish list below. Setup was just as easy as advertised. You can find setup instructions here. I did run into one gotcha: my pH EZO circuit had its baud rate changed from the previous project I was building with it. Thus, I had to manually go through different baud rates in a terminal until I found the right one and could set it back to the necessary default baud rate of 9600 to communicate with Eniac. The web interface was a bit clunky when working through a browser on the Pi itself, but it was very responsive once I connected through a browser on a much faster computer connected to the same network as the Pi. Find the IP address for your Pi (displayed on the Eniac homepage if you have a monitor connected to your Pi), and enter it into your browser to reach the server from another computer. Screenshot of the Eniac home page. Click the image for a closer look. I was impressed by the on-the-fly configuration Eniac offers. Programming a calibration routine for the pH probe from scratch was not the most trivial task. The web interface allows you to stick the probe in the various calibration solutions and calibrate the probe on the fly. You can also manually set the temperature offset or connect an Atlas Scientific temperature senor to automatically adjust the probe readings based on the current temperature of the solution. Screenshot of the calibration page. Click the image for a closer look. The Eniac server still has some bugs that need worked out, but, for being in beta still, I was very impressed with the overall performance. 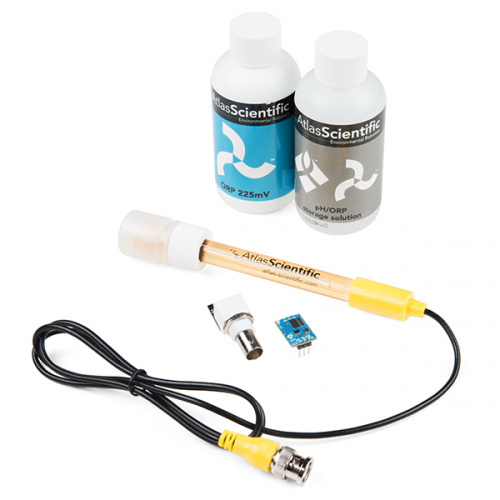 For users who aren't looking to have to solder or program, this is the perfect solution! However, you will be paying for that convenience. Atlas' products are pricey, but you get a quality product for the cost. And for many building large-scale greenhouses and farms, the cost is minimal compared with lots of other industrial solutions. The fact that each new sensor can be hooked up over USB makes this possibly one of the simplest solutions around. Exporting the data to an Excel file was quick and easy, allowing me to manipulate that data however necessary. The live graph is nice, but needs more functionality. I set the sample rate to 30 secs for this experiment, but will change that to a much lower rate. The biggest limiting factor about this system is the fact that it only communicates with Atlas Scientific sensors and probes. If it were to allow even just a few third-party sensors, such as the Waterproof DS18B20 Temperature Sensor, it would be a very versatile logging solution. I look forward to seeing what improvements Atlas Scientific makes to this system once a final version is released. If you've done some testing of your own, let us know what you think of the Eniac web server in the comments below. Thanks for reading! Thats really interesting! Have you ever looked into the Open Agriculture team's software? Theirs is designed to run on a RPi interfacting with an Arduino, so that sensors and actuators can be custom programmed and used to create control loops. I had not come across Open Agriculture. I'll have to give their system a shot too. Thanks for sharing! Thank you for the article and the parts list to go along with it. Looks good.